A beautiful new documentary illuminates the difference between an art collector and a patron who not only amasses a tremendous collection but whose taste and interests help define an era. The film takes us into the world of heiress Peggy Guggenheim whose passion for modern art built the reputations of artists Max Ernst, Jackson Pollock, Alexander Calder, Marcel Duchamp and many others she championed while creating her own collection. Her life turns out to have been as colorful as the canvases of the artists she admired. One of the reasons this historical biography is so compelling is that Peggy tells us the story herself. The Director, Lisa Immordino Vreeland, spent hours interviewing Guggenheim biographer Jacqueline Bogard, repeatedly visiting her Park Avenue apartment. Vreeland went through the mountain of research materials that Bogard had acquired for her book, "Peggy: the Wayward Guggenheim," but couldn't find the original audiotapes of the interviews with the heiress. Bogard didn't recall where she'd stashed them, and repeated searches of her apartment were fruitless. Finally, Vreeland asked if there was a basement. There was and buried under other boxes, she discovered a shoebox containing the long sought after tapes. These tapes gave Vreeland the ability to structure her film around very personal conversations. If you close your eyes while watching you'll feel like you're in the room with Peggy. But you won't want to close your eyes because this is not only a film built around the fascinating first person accounts of this visionary personality, it's also about the art, the artists and the images of the era in which they created what are now considered to be masterpieces. "I wanted to bring history to life," said Vreeland, when asked about her approach to making this film. Her use of never before seen archive footage, beautifully shot and transferred at a very high resolution, mixed with the aforementioned audio recordings, still photos and of course, the artwork, create a visual palette that lures us into the film. We meet Jackson Pollock, Picasso, Marcel Duchamp and see them in unguarded moments as this very small group of people are changing the art world. We discover they were very interested in ideas and how the outside world impacted their work. Events such as World War One had a major influence of them. "Dadaism was a reaction to that (the WWI) and led to surrealism," said Vreeland. The War is a stepping off point for Guggenheim who flees the confines of her life in Manhattan to meld into the Bohemian swirl of Post WWI Paris. Here she meets the artists, writers and intellectuals of the period, and through her café culture experiences, she begins to develop an appreciation and understanding of the monumental shift in art. "The art world was a small world and they didn't know this was the biggest thing in art in the 20th Century," said Vreeland. As her awareness about the importance of these new artists, she became their champion through the gallery she'd started in London in 1938. In Paris, the Nazi occupiers viewed the work she loved as "Degenerate" and the Louvre refused to take and protect the paintings she so admired. So the ever-resourceful Guggenheim bought and smuggled as many paintings as she could out of Paris. After the War she opened her Art of This Century gallery in New York City and brought the future of art to America. 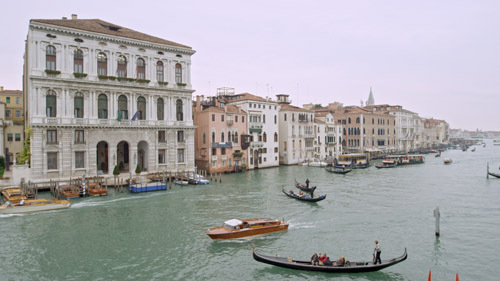 But it was Venice that was calling her heart and in 1949 she acquired the Palazzo Venier dei Leoni on the Grand Canal. This would eventually house her collection. A hero to artists and something of a seer she was also vilified for what some considered her voracious sexual appetite. She not only admired the work of artists she liked to sleep with them. Something she was quite open about. But her desire for new work faded after WWII and she turned her back on the next wave of artists. When Andy Warhol knocked on her door in Venice, "She wouldn't let him in," said Vreeland. She had her era and today the paintings she collected for as little as $25 or $40 are collectively worth "Billions" according to art dealer Larry Gagosian. This is important art that may not have come to light or even survived had it not been for Peggy Guggenheim. "I can't think of another figure like this who had such an influence," said Vreeland. PEGGY GUGGENHEIM: ART ADDICT, opens in Los Angeles on Friday, November 13, with a national rollout to follow. It runs 97 minutes and is being released by Submarine Deluxe.